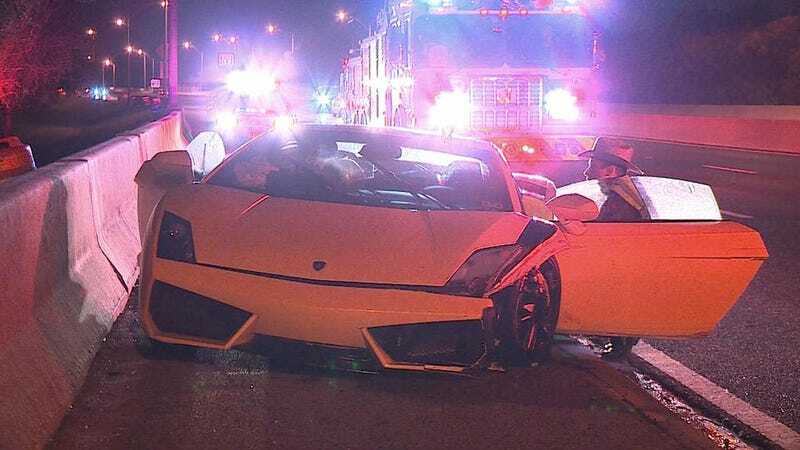 Why Did Someone Crash And Abandon This Lamborghini On A Dallas Highway? Crashing a car is always embarrassing. But is it so embarrassing that you should abandon your $200,000 Lamborghini on the side of the highway? Apparently one Texas Lamborgini owner thought that was exactly the case. Details are scarce on exactly what happened, but as WFAA 8 in Dallas reports, this yellow Gallardo was found damaged and abandoned on the Dallas North Tollway early this morning. There were no identifying documents in the car and police don't know who owns it. If you're so rich that you can just leave a Lambo on the side of the road, well, that's a whole new level. If you're reading this and you recently left a Gallardo on the side of the road outside Dallas, your car is now in the police impound. And I'm sure the police would love to hear your story. Update: WFAA now reports that a rental company, Exotic Skittles, has confirmed that the Gallardo came from them and was crashed by a renter.